Mossley Estate terminus. 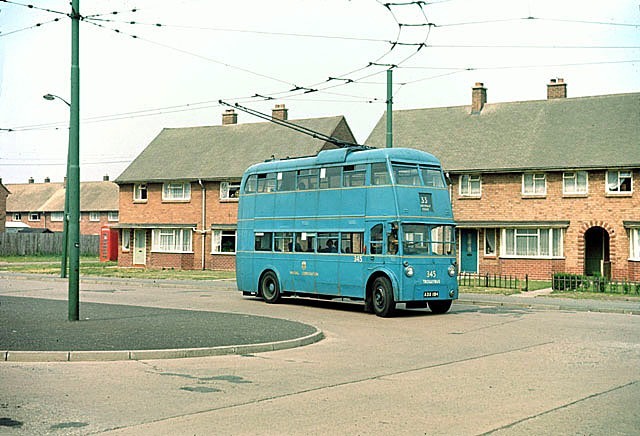 Walsall Corporation made significant extensions of its trolleybus network into new housing estates up to the 1960s. This is the Mossley Estate terminus. At the time there was no development on the other side of the main road over the photographer's right shoulder. Looking at modern aerial photography sites, the houses appear to have changed little; there is however no sign of a telephone box. The driver does appear to have set the wrong destination - the correct route number was 31. The trolleybus was one of several purchased second-hand from Ipswich which retained the very small destination display - virtually illegible at a reasonable distance.